There is a lot of work along Interstate 10. This view is along Interstate 10. The existing direct connector as Sunland Park road is currently being demolished. Really not impressed with this project, as most of it has been a mistake. The existing Interstate 10 alignment, should have been moved onto the pre-existing Paisano Blvd, just east of the Rio Grande, and the border. Keeping it east of the Union Pacific tracks. Asarco smelter is closed and removed! Shifting 10 could have freed up property for future development! 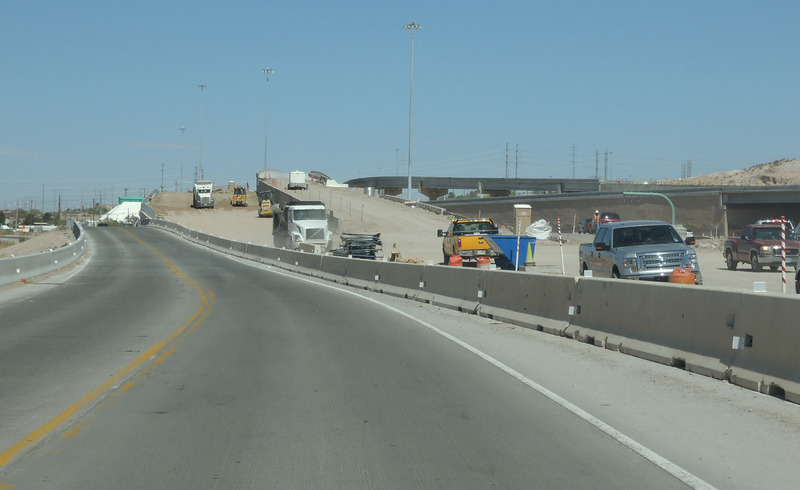 The tight curve at Exit 13, Sunland Park Dr, has not been eliminated! Which would have been done had the Interstate been shifted west. There is a significant incline, as well, east of Sunland Park, for both eastbound and westbound traffic on 10, also, that could have been eliminated had the Interstate been shifted west. That creates rolling cyclical backups due to trucking slowing as it goes up the incline from both directions. Just because an agency has money, doesn't mean it should simply throw it around without careful study and foresight. I'm wondering if they're still planning a US-62/Montana Avenue freeway out on the East side of El Paso. A lot of renderings and animated videos were produced of it years ago. As far as I can tell the project could be in limbo. I am surprised they are still building them. Well, it is Texas after all. A decent number of elevated "Lexus Lanes" have been added to big city highways in Texas over the past decade. Would guess such an undertaking, would be at least a decade away. There has been widening (to six lanes) and traffic signal replacements done on the Montana Avenue corridor (US 62-180) in recent years. It would seem senseless (and wasteful, another txdot theme) to rip all that out in the immediate future time frame. Such a facility (Montana Ave freeway) would essentially be an "orphan" facility, as it would not connect to a freeway at either end. It would cross the eastern side of the loop 375 facility, which encircles El Paso, and is built to varying (non Interstate mostly) standards. One thing the agency should have done, and should be thinking about, is ROW acquisition in certain areas along this heavily traveled Montana Ave. corridor. Vestiges of ROW preservation are visible along Montana Avenue in the Hawkins and McRae Blvd areas, likely from the sixties. Ironically that area is west of the proposed freeway upgrade. It does seem the cat is out of the bag long ago though, as development tightly hugs the corridor at many traffic signals and in certain stretches along the south side. Much of the north side is Fort Bliss property and perhaps the idea is to simply shift a hypothetical freeway with frontages to the north. A "Trowbridge Avenue" freeway was planned years ago, which would have used much of the Montana Avenue corridor, and then traveled to the west along Trowbridge Avenue to meet the current Patriot Freeway barely a mile north of present day Interstate 10. The amount of takings required along Trowbridge, to create an open path, and the obvious duplication of Interstate 10 were likely reasons for it's demise. 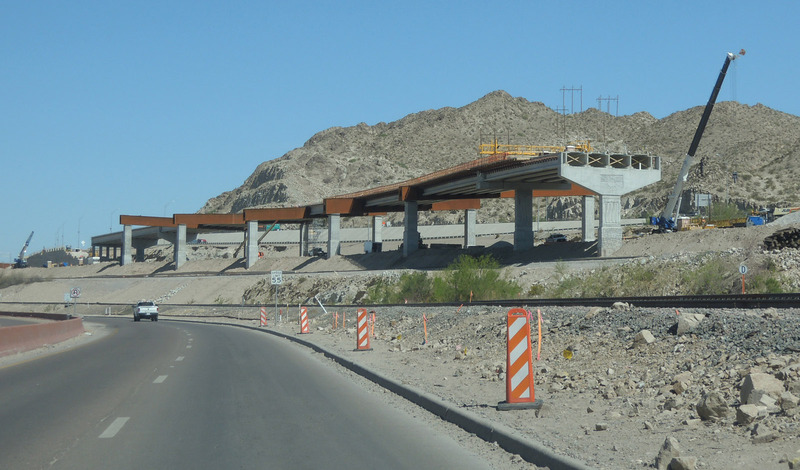 These elevated structures are being constructed in former Asarco Copper property, and along the Union Pacific RR tracks directly adjacent to the international border. It is essentially "brownfield" property, and there are no residential abutters to create opposition. Basically a path of least resistance in a quest (would term it obsession) to "complete the loop". 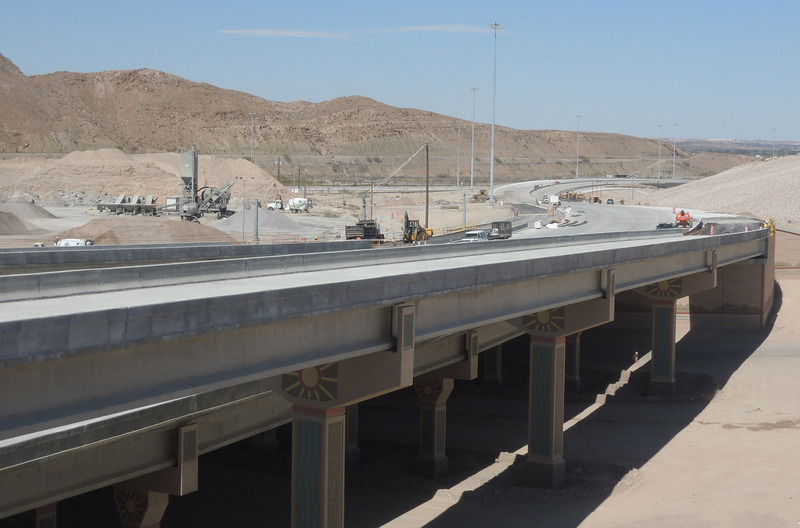 Improving pre-existing Interstate 10 geometrically should have been the goal. Is there any update to this project? Has anyone been through there recently or know of any news on its potential opening date? When I had my trucking job, I drove through El Paso regularly. I've seen bits and pieces of the Loop 375 Tollway going up, and even one BGS with a "375 Toll" shield, but it's very far from completion. Meanwhile, the construction zone on I-10 has been such a nightmare for so long that it's sometimes wiser to take the northern Loop 375 expressway, except that some of the hills are so steep they will slow fully loaded tractor-trailers down to around 35 MPH. Another option to bypass El Paso and the 10 mess is to zigzag through NE El Paso heading north from Loop 375 by means of either McCombs or Patriot Freeway to Warr Road. This leads to NM 213 and then NM 404 to rejoin 10 at exit 162. The absence of an Interstate grade facility taking care of this bypass movement is obscene. For a metroplex of its' size. Which includes Cuidad Juarez by necessity, as it is part of the metroplex. The Woodrow bean Parkway is not suited for this role, as it is a mountain Parkway with sinuous curves and 8% grades posted. NM 404 is currently just a 2 lane facility from I-10 to Chaparral and NM-213. But there's more than enough space to 4-lane it or upgrade it to Interstate quality. Going South and connecting into the Patriot Freeway (US-54) could be more tricky. There's not enough space along Martin Luther King Jr Blvd to upgrade that into a freeway. A new terrain route could dodge the North Hills West neighborhood to its West side, but the road would have to be built up some to avoid flash flooding. The neighborhood already has a fairly tall flood control berm there. That would still be a more desirable route than having the freeway concept connect to US-54 farther North and East. If such an Interstate quality bypass was built it might put more pressure on improving the interchange at US-54 and Loop 375. There are no direct connect flyover ramps on that interchange currently. Believe that there were some scoping at one time, for a new terrain route leaving "Loop 375" (still despise that designation) east of Railroad Drive, and shooting to the NW, across the far Northeast side (or fan) of El Paso. It should have been as straight as possible, crossing the rail road, and the arterials of Railroad, Dyer, and McCombs, before reaching open range land (Bowen Ranch). Would meet, and bridge, NM 213 north of state line, and follow high tension lines to the saddle of Anthony Gap. This would remove the heavy turning movements at the fruity "rotary" at the NM 213/404 intersection. NM 404 would be "double barreled" west of there, west of the Gap, all the way to Interstate 10. Variable width median, and varying elevation for the two carriageways would be utilized. Minimum 88 foot median would be employed, over 100 feet would be better. Box Beam flyovers would carry both 10 south to 404 east (future I-210) and 404 west to I-10 north traffic. There is a community college and a ranch property at this interchange. The west to north flyover could be omitted if ranch property is acquired and leveled. The south to east flyover would go over the 10 mainlines, and behind (south) of the community college. Other movements would utilize existing 404/I-10 diamond interchange. 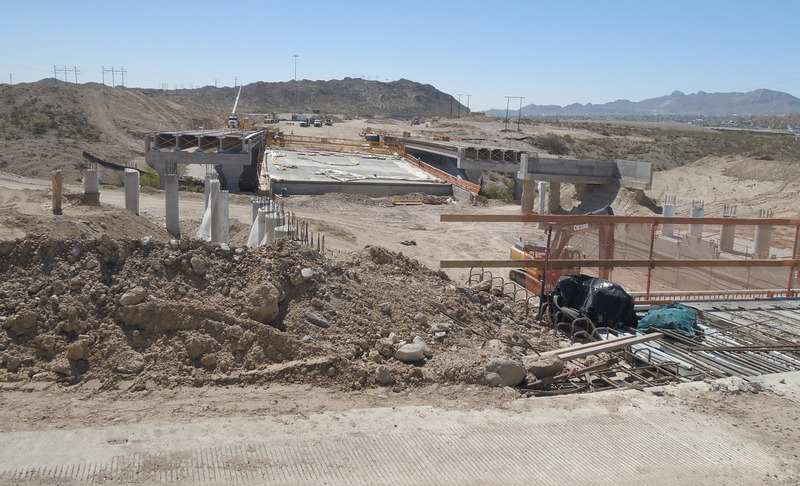 The I-10 frontage road, on the west side of 10, in the vicinity of the NM 404 exit, was moved farther away from the interstate, in a possible preparation for this necessary eventuality. Although no fan of the NM department, that was a good move. Just no concerted effort to move on this needed routing / facility. Heads in the sand, ostrich-like behavior. This project is of more importance than the adopted "Move 10" fiasco, imho. 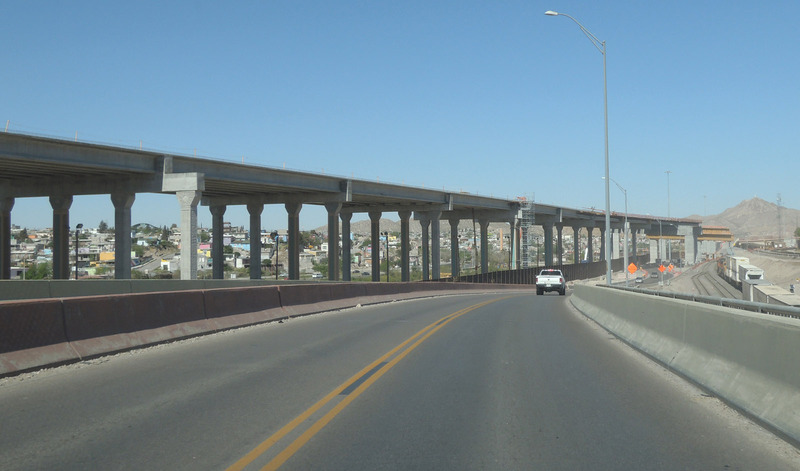 In terms of rational connectivity, and removal of long distance trucking from downtown El Paso. Any official documentation available regarding this bypass project? The timeframe in which it was considered would be telling -- particularly since it likely predates the TX penchant for toll facilities. If NM would have had to participate in the project -- given its abject lack of interest in 3di's or similar bypass concepts (e.g. US 70 around Las Cruces and/or an Albuquerque outer loop -- even partial) -- the lack of follow-through might be explained -- if not rationalized. 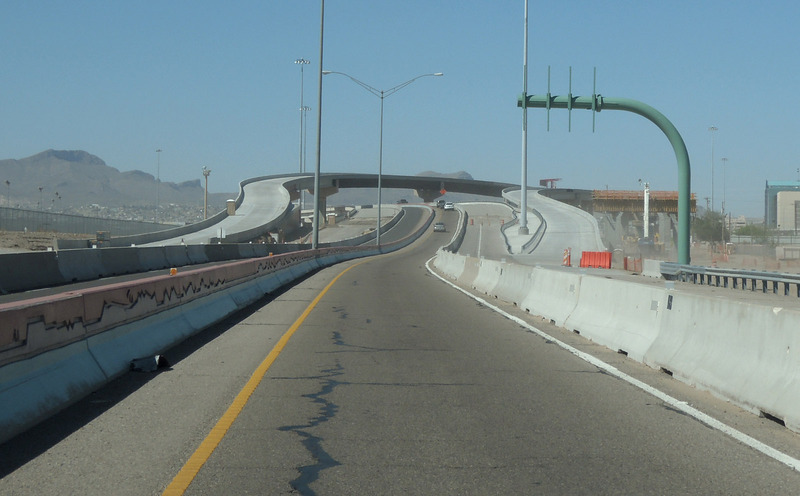 New Mexico does about as little as it can improving its highways. It seems like there usually has to be some kind of severe safety issue for them to convert a 2-lane highway to 4-lane on their own. Recent 4-lane projects, such as the US-64/87 part of the Ports to Plains Corridor from Clayton to Raton, were parts of larger multi-state/national efforts. 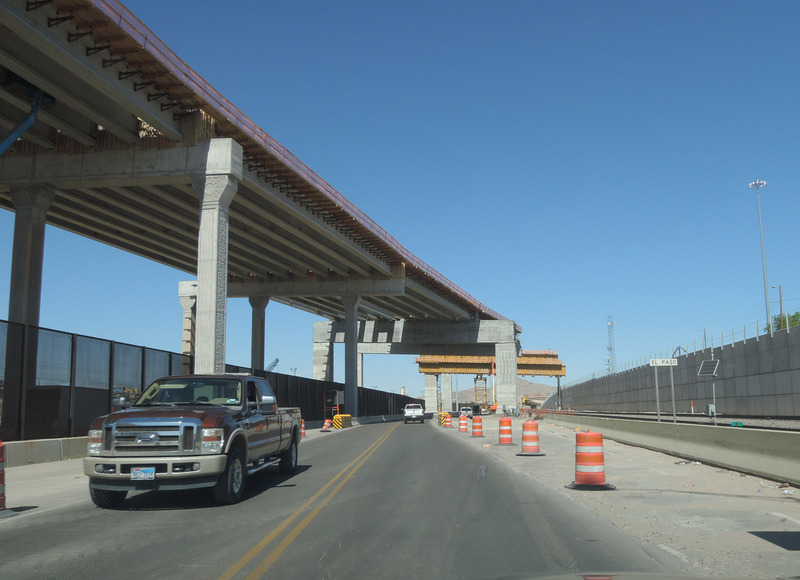 TX DOT would likely have to chip in some money for an Interstate quality upgrade of NM-404. A new terrain route could spur off Loop 375, following the diagonal route North of Biggs Field on past the Northern fringes of El Paso. But some agreements would have to be worked out with Fort Bliss for that ROW. It might not be the best path since the Fort Bill Rod and Gun Club has its ranges aimed in the direction where the concept highway would run. A large berm would need to be built up around the gun range and perhaps the highway might need to be trenched and/or lined with barrier walls. It was a proposal of the Camino Real Regional Mobility Authority as recently as 2008. I remember seeing official documentation of the proposed "Northeast Parkway" to be a toll road from Loop 375 to the NM border. From the 2008 Comprehensive Mobility Plan map, you can see the generic proposed route here: https://crrma-production.s3.amazonaws.com/documents/files/000/000/007/original/1_-_2008_CMP_-_Map.pdf?1480523942 This CMP called for ROW acquisition to begin in the 2008 - 2013 timeframe. I got a good laugh of the route shown in the Project Location Map PDF. It makes a big crazy loop when it splits from Loop 375, all to get around the Fort Bliss Rod and Gun Club range. They'll have to bridge over or under the access road to the gun club. But that loop and extra bridge work might be cheaper than all the earth work needed for a straight route. And even with berms, putting the road into a trench, etc the road would still not be safe from stray rounds. Some people are really really stupid with guns and rifles. That proposed route for the Northeast Parkway just gets a potential freeway built up to the New Mexico border. 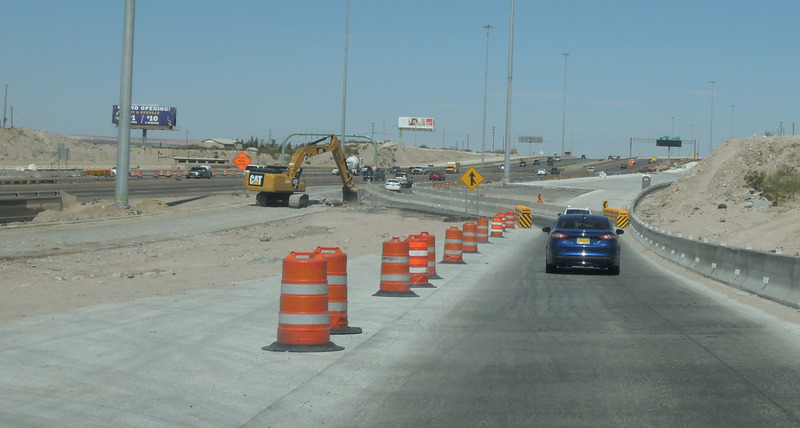 It's still going to be up to NM DOT to build their portion of the super highway on NM-404. Regarding the intersection with NM-404 and NM-213, I would hope that NM DOT would split a new freeway away from the existing NM-404 alignment shortly after it passes East of the mountains. It would be better for a new terrain road to run straight East, rather than ENE toward Chaparral. Just before reaching NM-213 the highway could curve SE and pretty much run straight into the proposed Northeast Parkway route. Don't know the date of that aerial that the tex-dot uses in the link, but it shows a potential ROW existing between Sean Haggerty and the Patriot Frwy (US - 54). Along with a patchwork of open properties to the south/southeast. Their proposed route shows extra length, by looping around development entirely to the east. Am guessing that infill has already consumed some of that property. Planning is not exactly a strong point in this part of the country. The El Paso area appears to be growing fairly rapidly. So if TX DOT wants to be able to build the Northeast Parkway from Loop 375 to the NM Border they had better secure the ROW for it ASAP and begin building out the frontage roads. I think if that corridor along with NM-404 was properly built out it would attract a heck of a lot of long distance truck traffic. Big rigs would be able to avoid all the traffic in El Paso and would have an easy route through the mountains, one far better than the steep one Loop 375 takes.